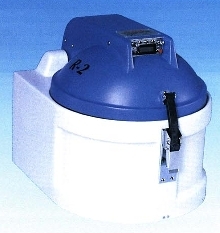 Model R-2A non-vacuum solvent recovery unit distills waste solvents with boiling points between 95 and 375 deg F. Cast-in aluminum heater provides enough heat to distill up to 4 gallons of solvent in 8 to 12 hours. Siva's R-2A non-vacuum solvent recovery unit distills waste solvents with normal boiling points between 95°F (35°C) and 375°F (190°C). The cast-in aluminum heater provides enough heat to distill up to four gallons of most solvents in about 8-12 hours. Excess paint and solvents for cleanup are a couple ways companies generate hazardous waste. Recycling is the economical, common sense, and environmentally correct solution. Siva's R-2A unit can help you reduce your liabilities, reporting, taxes, and generator status easily and effectively. Typical payback is less than one year. One major customer of Siva began using the Siva R-2A system in the last part of 2001 for distilling paint, turpentine, alcohol, isopropyl alcohol, paint thinner and reducer and have reported an approximate savings of $7,000.00 per month in waste management fees. Since the harmful wastes are being boiled out, the harmful solvents are no longer considered hazardous and waste disposal fees have been completely eliminated. Compared to the list price of the Siva R-2A, this customer's payback is a remarkable 40 days! For more information, request Catalog #1241501.